Yesterday J introduced me to the work of Tara Donovan, a contemporary installation artist who uses everyday materials (e.g. straws, adding paper, scotch tape) for her art. 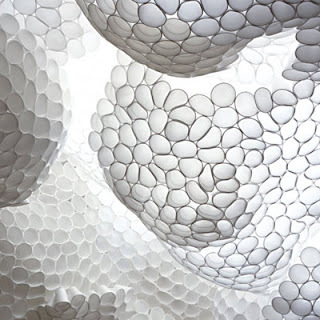 The installation shown in the image is made out of styrofoam cups and hot glue. Donvan was among the recipients for the 2008 "Genius Grant" given by the MacArthur Foundation. You can see some of her work here. I think it's really stunning. I think my two favorites are this styrofoam cup installation and another installation made of adding paper. What do you think? Which installation do you like?